What does it mean to say that citizens have control over their leaders? In a democracy, citizens should have some control over how they are governed. If they do not participate directly in making policy, they ought to maintain control over the public officials who design policy on their behalf. Rule by Multiple Majorities develops a novel theory of popular control: an account of what it is, why democracy's promise of popular control is compatible with what we know about actual democracies, and why it matters. 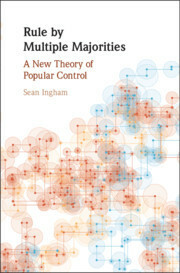 While social choice theory suggests there is no such thing as a 'popular will' in societies with at least minimal diversity of opinion, Ingham argues that multiple, overlapping majorities can nonetheless have control, at the same time. After resolving this conceptual puzzle, the author explains why popular control is a realistic and compelling ideal for democracies, notwithstanding voters' low levels of information and other shortcomings. 1. Introduction; 2. First attempts; 3. An objection from social choice theory; 4. The concept of control; 5. Rule by multiple majorities; 6. Retrospective voting and control; 7. On a normative theory of democracy; 8. Conclusion; Bibliography; Index. Sean Ingham is Assistant Professor in the Department of Political Science at the University of California, San Diego. A political theorist whose work combines political philosophy with game theory and social choice theory, he has published in the Journal of Theoretical Politics, Politics, Philosophy and Economics, Political Studies, and Political Research Quarterly.